« When Arsenal changed its name for the 5th and final time – and 50,000 turned up. 5 December 1885 Millwall beat Eastern Wanderers 3-1 at Glengall Road. This game has significance because it gives us a record of Eastern Wanderers, playing in this area and around this time. The first Arsenal game (as Dial Square) took place, on the Isle of Dogs (where Millwall played) against Eastern Wanderers one year later. 5 December 1886: A likely date either for the setting up of Dial Square FC or a practice match ahead of the first game. 5 December 1904: Woolwich Arsenal 26 Parisian XI 1; one of Arsenal’s biggest wins. It is reported that the French team were a man short and used an Arsenal reserve to make up the numbers. 5 December 1916: King George V asked the Conservative Party leader Bonar Law to form a government. However Bonar Law declined the request, feeling it would be impossible to hold any sort of administration together. 5 December 1920: In a vote that is perhaps hardly remembered now, Scotland voted against prohibition of alcohol in the country. 5 December 1921: The FA cited opinions about football’s unsuitability for females and told registered clubs “to refuse the use of their grounds for such matches”. The ban destroyed women’s football and was not lifted until 1971. Even to this day, the FA has (perhaps typically) never apologised either for the ban or the delay in lifting it. 5 December 1925: Arsenal drew 2-2 against the champions: Huddersfield Town away having lost their last two games against them 4-0 and 5-0. Neil and Buchan scored and the result meant that Arsenal had played the current top team and last season’s champions and gained three out of four points. Norseman was full of praise. 5 December 1931: Arsenal won 3-1 away to 4th placed Sheffield Wednesday. Jack got two meaning he had now scored 11 in the last seven games – scoring in each match having scored only two in the first ten games he played. 5 December 1936: Arsenal lost to Manchester City after four consecutive wins in which the team scored 16 goals. But thereafter Arsenal lost just one match in the next 14, and scored 13 in the next three. 5 December 1959: Lee Chapman born. He started out with Stoke with whom he played 99 league games and scored 34 goals, but he was never able to rediscover that form at Arsenal. 5 December 1960: Arsenal lost 1-3 to Chelsea in the London Challenge Cup final. The competition had started out as a tournament for the first half of the season but had moved to an April or May final in the 1930s. This was the first season it returned to a winter final. 5 December 1967.Pat Rice’s first start for Arsenal in the League Cup against Burnley. Arsenal won 2-1 with goals from Radford and Neil. Rice had already been listed as the substitute a couple of times, but had not been called upon. 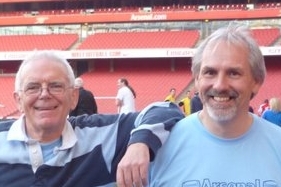 5 December 1970: Man City 0 Arsenal 2. Armstrong and Radford scored in League match 20 of the first Double season. 5 December 1981: Last game for Pat Jennings, the first man to play over 1000 senior games. Arsenal beat WHU 2-1 with Hollins and Whyte scoring. It was the 5th of 6 consecutive wins, but the 6th game was not played until January 20 because of bad weather. 5 December 2006: Matthew Connolly scored for Arsenal against Nottingham Forest. He later went on to win the Championship three years running with three different clubs! 5 December 2009: After a 0-3 home defeat to Chelsea Arsenal beat Stoke 2-0 to start a month of five wins and one draw. It was Arsène Wenger’s 500th game in charge.